Capricorn Recording Studio, comprised of two buildings constructed in 1900 and 1910, served Macon as a Mecca for Southern Rock during the 1970s. Famous bands such as the Allman brothers Band, Charlie Daniels Band, Dixie Dregs, and the Marshall Tucker Band, Wet Willie, and Cowboy all recorded within its soundproofed walls. 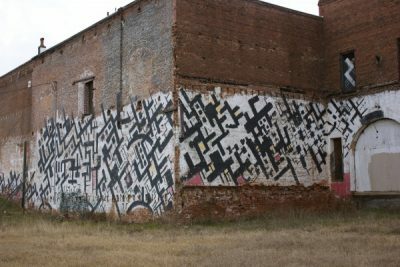 The mural by Michael Pierce that encompasses one side and rear of the building memorializes the rythmic and occasionally staccato beats that filled not only the building itself, but also the city of Macon during its musical hay day. In early 2011, NewTown Macon, a non-profit public private partnership, purchased the Historic Capricorn Recording Studios in Macon, Georgia with hopes of restoring the studio, creating a multi-use building, and celebrating the music that was recorded there. The building was on the Georgia Trust for Historic Preservation's Places in Peril list. With a grant from the Peyton Anderson Foundation and NewTown was able to save the building.Town was able to save the building.